Bitcoin, Freedom, and the Future of Finance? IDFC-U hosted a private roundtablewith Bhagwan Chowdhry, Professor of Finance at UCLA Anderson, on "Bitcoin, Freedom, and the Future of Finance?" Chowdhry explained why he believes "Bitcoin is just the beginning. Smart contracts are next. Finance is about to undergo a revolution." The discussion explored how three important recent developments are about to drastically change how we think about money, contracts, and trust - mathematics of cryptography, nearly zero cost communication using internet, and decentralisation of computing. When talking about the origins of money, Chowdhry explained that the bulk of the function of money in primitive economies was to act as a ledger. Though there is a widespread perception that money first acted as an efficient replacement to the barter system, Bhagwan explained that this accounted for only a small part of the origin of money. In villages, records of a ledger were announced in public places or engraved. The modern version of this is a spreadsheet, which is recorded on the internet. Money, Chowdhry said, is a secured message of a transaction. However, there needs to be a consensus about the use of a medium to secure messages. Chowdhry explained that Bitcoin is a kind of ledger. Such ledgers do not have to be used only for money- any promise or contract can be executed using processes similar to Bitcoin’s, that is, if it creates a ledger that is public and if its records cannot be changed. Chowdhry predicted that Bitcoin is just the beginning. Its mechanisms would change many aspects of how the world works, from escrow accounts to land records. Several mathematical advancements help make transactions on the internet secure. The breakthrough in cryptography in the late 1970s and 1980s allowed widespread encryption of data by creating public and private keys that would need to be combined to access information. It is almost impossible to decipher the information using just the public key, because the keys operate as a one-way function. Hashing of information allows a message of any length to be presented within 256 characters by converting the information into a series of 0s and 1s. Hence, enormous amounts of information can be stored in electronic ledgers, allowing users to maintain and pull up secure records with relative ease and certainty. Bitcoin’s ledger records all its transactions that ever took place, and in principle, it can keep recording transactions in perpetuity through hashing. Old data is hashed together with new sets of data, creating block chains. So, if a transaction is made in Bitcoin, its record exists forever, and there is no need to approach a notary or other institutions to confirm that it occurred. Users are “pseudonymous”, because it is possible to find the identity of its users by tracing transactions. The value of Bitcoin was also created by the generation of a limited number of its units, which will all be issued by 2040. It is designed to be a deflationary currency. Others may set up other currencies that function differently, for instance, by creating an inflation rate of 2%. The discussants considered that while arbitrage opportunities in Bitcoin due to liquidity issues will diminish, such opportunities arising from government regulations would remain. Since Bitcoin creates an indelible message, it is more than an electronic means for payment, Chowdhry said. Bitcoin can be used to record contracts, and showed how consensus can be achieved in an open and democratic fashion without the need for institutions such as banks. Chowdhry surmised that Central Banks would ultimately have to create their own digital currencies, though this may upset the libertarians who championed Bitcoin because of its independence from government institutions. Several variations of the Bitcoin have already been set up. For instance, Stellar is building a common financial platform using secured messaging, wherein a ledger records money as credit, which is issued by traditional gateways like banks. Etherium digitises smart contracts to ensure that applications run without downtime, censorship, fraud, or third part influence. Chowdhry noted that such transactions occur in seconds, rather than in milliseconds, which is helpful because if prevents high frequency trading. Many other forms of contracts and transactions, such as those of options, futures, and derivatives, would soon occur through such electronic ledgers, Chowdhry predicted. Honduras has already begun digitising land records in this way, using hashes. Similarly, anything that requires signatures can be automated using encryptions. Keys to rented cars and apartments can be issued by making the renter’s fingerprint the key for the specific period of the rent through such automated processes. Many functions of lawyers and accountants will be made redundant or will be radically changed because of the reduced need for human intervention. The way accounts are maintained also stand to change completely. If these possibilities are combined with progress in Artificial Intelligence, we may not be able to comprehend the extent to which the world will change. Reducing transaction costs through these processes also has other positive effects, such as improving financial inclusion. However, Chowdhry cautioned that it was possible for such systems to be hacked. Chowdhry also guessed that another, cleaner version of Bitcoin would emerge, which regulators would prefer. 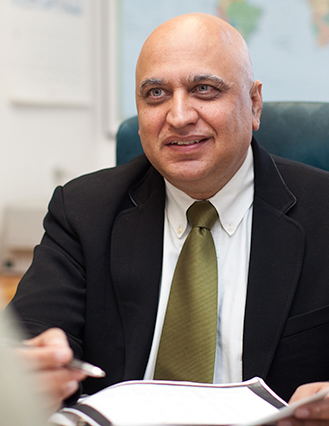 Bhagwan Chowdhry began his teaching career at UCLA Anderson in 1988. His research interests are in international finance and corporate finance and strategy, topics on which he has published several papers in economic and finance journals. He has served on the editorial boards of a number of finance and economic journals, including Journal of Finance, Review of Financial Studies, American Economic Review and Journal of Political Economy, and has organized and taught executive education programs on financial derivatives, corporate risk management and valuation in Los Angeles, Singapore, Hong Kong, Mumbai and Hyderabad. He is a frequent contributor to the Huffington Post. He has a Ph.D. Finance from University of Chicago.